I have always been interested in art. I’ve always had a desire to capture and reproduce things I see. When I was younger I painted from my imagination and tried all kinds of different media. After being introduced to oils in my first painting class in college, I found my lifelong pursuit. I have a Bachelor’s degree in Fine Arts and Psychology from the University of Pennsylvania and two additional years of painting study at the Pennsylvania Academy of Fine Arts. Which teachers/family members influenced you? My grandfather (Russell Barnes) was a landscape architect who really encouraged me to pursue my interest in painting. I had many wonderful teachers, in high-school at Penn and at the Pennsylvania Academy of Fine Arts. In terms of my painting style I think I was most influenced by Jimmy Lueders, Sydney Goodman and earlier, Neil Welliver, who were all teachers of mine. Welliver was head of the painting department at Penn when I was an undergraduate. I studied with Lueders and Goodman at the Academy. When did you know you had some talent for it? When I was in 5th grade, we had a school assignment to do self-portraits and there was an exhibit in the gym. I remember everyone exclaiming over mine and saying it was the only one that actually looked like its subject. I remember thinking, “this is something I’m good at.” When I became a professional artist, I realized that being successful really has very little to do with talent, and a lot more to do with determination and simply being disciplined enough to keep at it every day. © 2016Joseph Glantz. All rights reserved. When you're sharing war stories with your artistic friends what's your lead story. That’s a really tough question. I guess it would be finally getting into a New York Gallery (Sherry French) in 2008, only to have it close with the economic downturn in 2009. That was a huge blow. What locations would you still love to do? I am pretty happy painting almost anywhere I find myself. 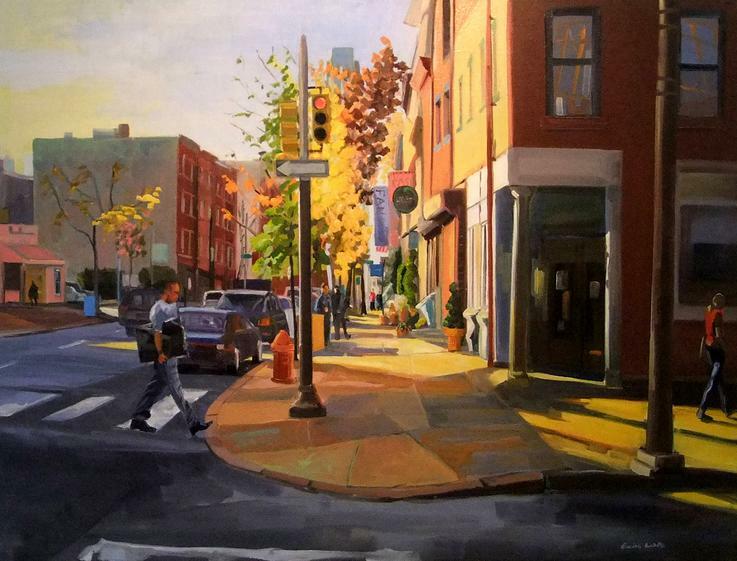 Because I live in Philadelphia, I paint a lot here, but I am happy to go anywhere to paint. I am always looking to “interpret the light” and I try to keep my camera and sketch book with me at all times. At some point I would like to paint in Tuscany, Eastern Europe and the Southwestern U.S.
Do you teach/consult/ or are you lucky enough to just paint? 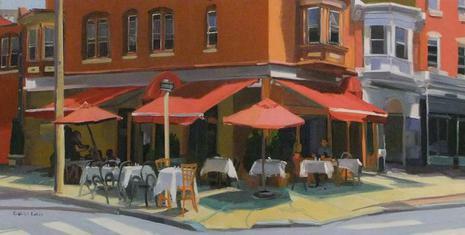 I teach at the Main Line Art Center in Haverford, which has been a wonderful experience. Teaching forces you to break down your process and by doing this, you experiment and improve along with your students. I’ve also consulted with a number of artists who wanted individual criticism. even when you’re painting busy intersections. 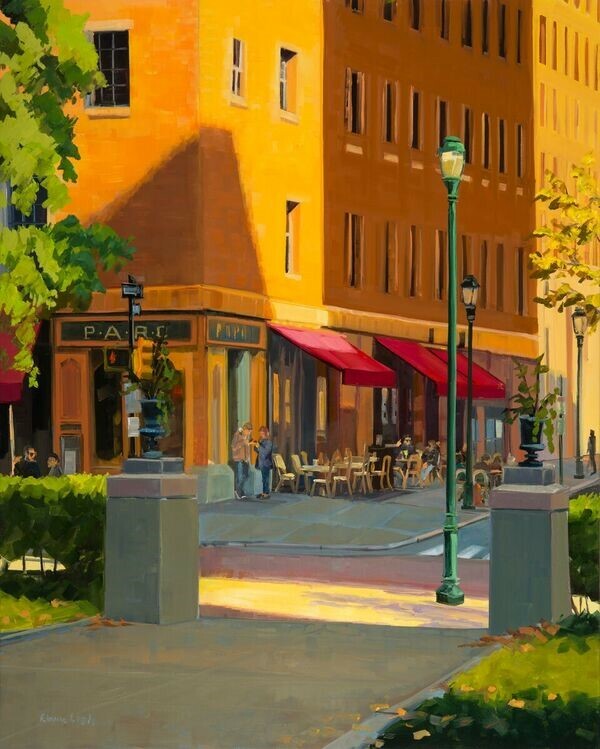 What color choices and non-color choices do you make to give these city paintings their humanity? Do you read any books about art like Jonathan Harr’s book – The Lost Painting? Or is reading a holiday from art? My reading is generally for pleasure, unrelated to art, but I do have a list of art-related books that I am working through as well. I highly recommend Art & Fear (David Bayles & Ted Orland), a great book that addresses artistic angst and inspiration. 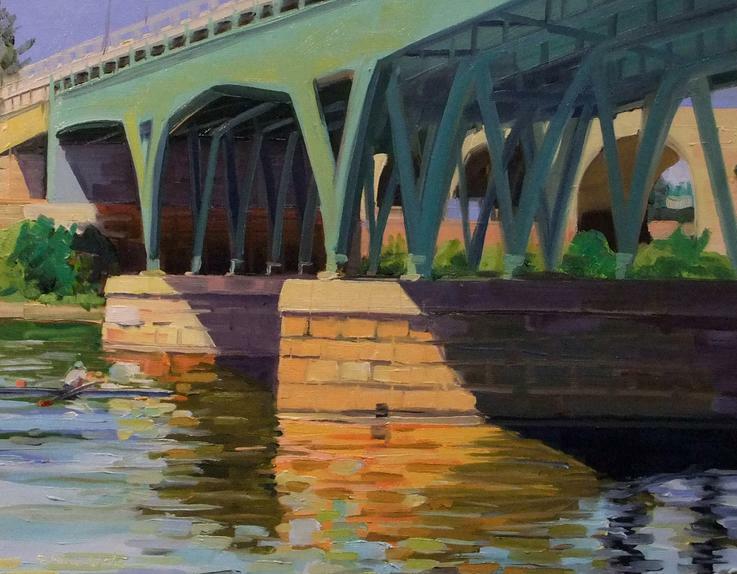 You exhibited paintings of Charlottesville, Virginia; Easton & Annapolis, MD; Casteaine, ME; Squam Lake, NH; and New York City at the New Leaf Club (a nonprofit dedicated to helping Main Line youth) in Rosemont. The exhibit included paintings of marketplace, rural country-sides and seascapes. 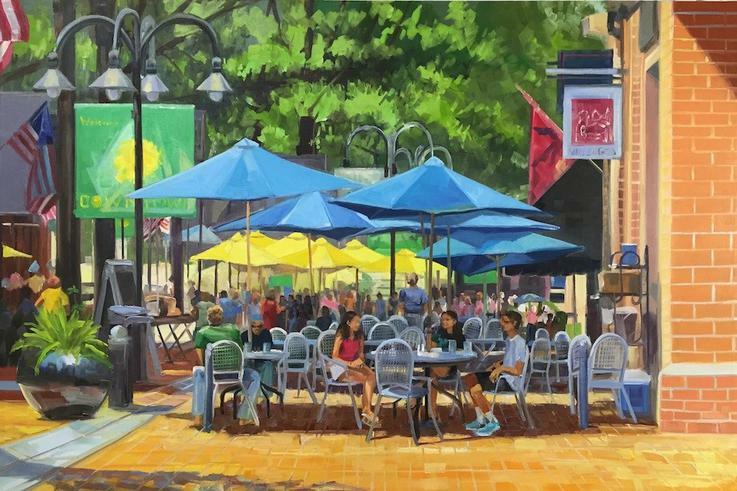 I like how almost any object in the Charlottesville paintings was an impetus for your wonderful colorful expression - the awnings in Yellow Umbrellas Downtown and Lunch on Charlottesville Mall, the different colored newspaper dispenses in Rock Paper Scissor or the warm chairs in the Maryland painting Night at the Place. What is it about the smaller elements that drive the creation of many of your outdoor scenes? When I begin a painting, I am always looking for the unusual and the colorful. Awnings and umbrellas have always inspired me for this reason. They help to set up the composition and draw the viewer in. Every painting needs a focal point- sometimes this is a figure, sometimes it is simply the way the light bounces off a brick wall. Describe your general career path? After I graduated from Penn, I worked as an Activities Therapist at the Institute of Pennsylvania Hospital with severely young adults who were undergoing psychiatric treatment. I was responsible for the “Art Room” and we had every type of medium available. I was there for three years. Then I left to study painting at the Pennsylvania Academy for two years. After two years I felt the need to give up painting for economic reasons, so I worked in marketing and advertising for a few years. 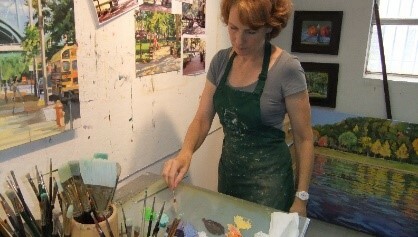 After getting married and having children, I once again began to take art classes and eventually rented a studio and turned it into a profession. I have now been painting and teaching for nearly 25 years. For those not in the art world, describe what your process is in creating a painting? Which mediums do you prefer? How long does it take to create a painting? I work only in oil. Generally I like to work “en plein air” (outdoors) from life, to do small studies (sketches). I also take many photographs. Then I create large compositions in the studio using the photos and sketches as reference. 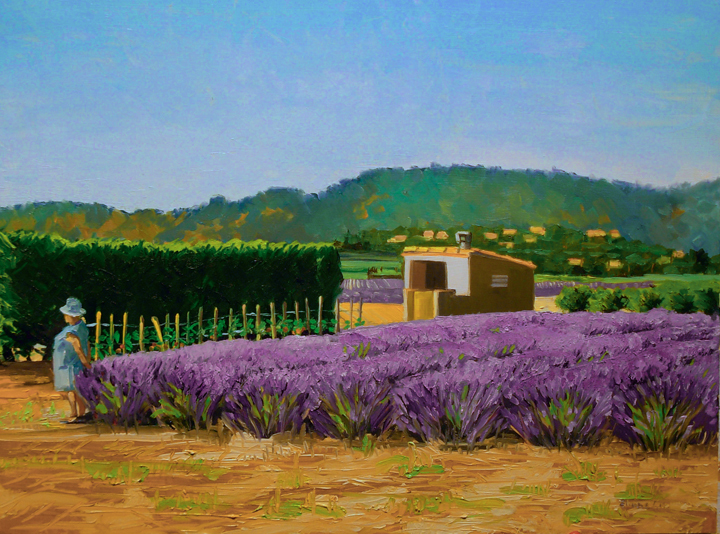 It can take anywhere from a few hours to a few weeks to finish a painting. I try to work on several subjects at a time. Sometimes I lose interest in a subject and put it aside until I feel sparked to finish it. Your colors are so vibrant. How do you create them? How do you choose the right painting support? I use a classic palette and tend to exaggerate what I see to produce more contrast on the canvas. I use smooth primed canvas for my larger works. Sometimes I stretch them myself, but generally I purchase pre-primed canvas. I like to work on primed boards for the smaller pieces because I like the hard surface, and there are many great options now on the market. Your water paintings are spectacular? Is it the water or is it you? Capturing the look and feel of water can be very difficult but very satisfying when I’ve been successful. I like to paint realistically, but I am drawn to a much looser style. Painting reflections in the water allows me to be looser (by loose I mean the brush strokes are visible) and thus more abstract - something I hope to achieve more of in my overall painting style. Do you use psychology in your work? Is there a different psychology for urban paintings vs. landscape? There is not really any psychology in the way I paint. I am simply trying to create something on canvas from a subject that appeals to me. Painters will tell you that they see paintings everywhere - we are always looking for the next composition. It can be a blessing and a curse, because sometimes you see a great painting but you have no tools with you to record it, or there is no time. The other day I was working on a painting of a tractor and mulch pile behind a barn. An hour later, the farmer decided it was time to spread the manure with the tractor, so my subject simply disappeared. For some reason I have this need to reproduce what I see, from my perspective, with paint on canvas. Describe the process – pitfalls and joys of selling your art? Where do you show them? Who do you target? What completes the sale? Do your paintings have cross-over appeal? Do people in Paris buy your American art and do people who like urban art buy your landscape and water art or are art buyers provincial? People often like to purchase reminders of where they have been. Most of my buyers are from the U.S., but I do have some collectors from other countries. In general collectors seem to like my urban art or my landscapes, but not both.